The Passcreator Companion app allows you to easily validate Wallet passes that you've created with the Passcreator online app. 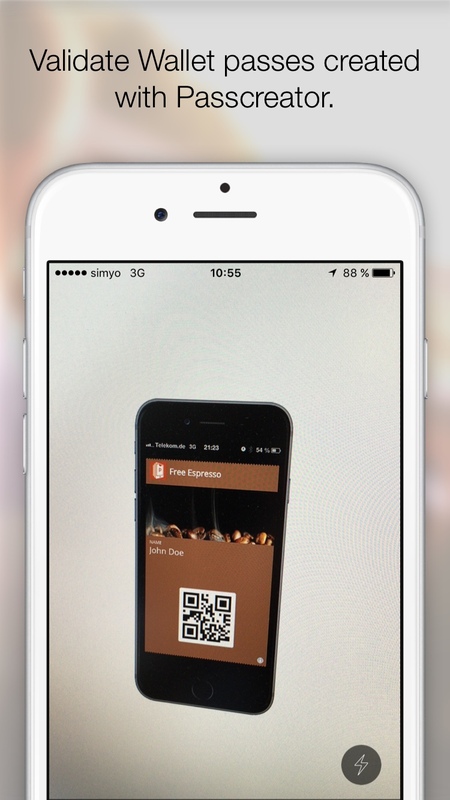 Use the integrated barcode scanner to scan the Wallet pass of your customer and the app will tell you instantly if the pass is valid or not. The app contains two modes in order to cover most use-cases. One mode voids the passes after they have been scanned, the other mode only saves the attendance of a visitor. If you have no internet connection where you're planning to use the app you can switch it to offline mode. It then downloads all pass data and makes it available offline. Scans are synchronized as soon as offline mode is turned off. If someone else should validate passes that doesn't have your credentials for the Passcreator app you can create a configuration link online. Using this link the app will be configured without knowing the credentials. Please note that you should use 2D barcodes if you plan to validate passes with the app since 1D barcodes are a lot harder to read for cameras. You can download the app for free on the iOS App Store.